Jack must have started his infamous climb to the sky from a backyard in Brooklyn. While not the eponymous beanstalk with which most of us are familiar, the seventy-five foot high Concord grape vine in my backyard reaches so daringly up to the clouds that I am convinced it is the real thing. In my Carroll Gardens neighborhood of Brooklyn almost everyone who’s lived here more than 20 years is Italian, if not by birth than by family heritage. 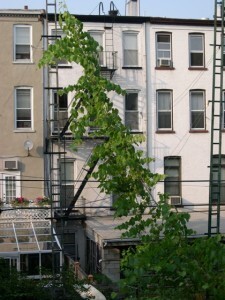 Never daunted by how far north we really are, these Italian-Americans miraculously succeeded in recreating a natural looking sliver of their heritage in urban Brooklyn, U.S.A. Every summer, our hearty grapevine actually latches onto the sturdy 60 foot laundry pole outback. Ubiquitous in Carroll Gardens yards, these enormous, once utilitarian poles shoot upward from each and every yard. According to my neighbors Pete, age 75, and Vincent, age 96, their parents planted the grape vines decades ago, hoping for a seasonal reminder of the old country. They just wanted a bit of Italian flavor to remind them of their childhood. To this day, I am convinced we harvest enough grapes to make a few bottles of wine! On a typical July Saturday, I usually pull myself into the hot, sweltering sun to give the garden a swish with the hose. Vincent and I often find ourselves on opposite sides of the chain link fence, quietly puttering about our little plots of grass, discovering what has survived and what has wilted in the heat. Sometimes we talk and sometimes we acknowledge one another without words, preferring to allow the glory of our modest gardens to surround us with a kind of silent dignity. It is during these completely non-verbal, but somehow exquisitely friendly, moments that we both look up at the vine, awed by its stature and resilience. About three times a summer, he sheepishly asks me if he should cut it down because it may be impeding my ability to dry the clothes. Each time, I remind him that I own a dryer and that such Brooklyn flora will always be near and dear to my heart. No botanist in his or her right mind could have been convinced that the grapevine in my backyard would survive the climatic and environmental challenges we experience in Brooklyn. It shouldn’t be but it is! What a glorious time I have with my two daughters each summer as we watch the hearty, verdant vine climb once again up the pole. There are only a handful of neighborhood residents who still depend on these poles to facilitate the delicate drying process of their sheets, socks and nightgowns. It must have been a splendid sight to see such an abundance of colorful cloth flapping in the breeze of a Brooklyn August morning. For me and my imagination, the pole has but one purpose now…propelling a brazen grapevine straight to the sky. We live about four blocks from a strangely desolate block of scrubby trees and grass that was one of Brooklyn’s most active fuel oil companies a few decades ago. Unfortunately for the residents of this community, when the oil company moved away and tore down its industrial structures, it callously left a plethora of environmentally hazardous materials in its wake. On the surface, this empty plot of land nestled between the Brooklyn-Queens Expressway and the Gowanus Canal looks like the perfect spot to create a park. Face it. We need all the green we can get. The problem, however, lies just under the epidermal layer, where old containers of oil have been left to rot and seep into the dirt. Discouraging as this past history is for all of us, here too, there is a sense of hope. People are beginning to imagine the possibility of cleaning up this little area of Brooklyn – excavating, planting, and transforming an egregious situation into a possibility for green. I’m considering throwing a few grape seeds over the wire fence.